Having made my point about the latest findings about professional cycling quite clear on Twitter, still wondering if it was a waste of my time or not, I’ve been itching to fill this blog with a bit more life again. It’s been, as ever, an interesting few weeks that have passed since the last post, and the lack of posts is fortunately not due to a lack of ideas or days away, the latter ones are more to blame for the lack of time to fill some lines here. It’s been a good couple of weeks that have passed, and with staying on at Scottish Swimming as Marketing Development Manager until the Glasgow Commonwealth Games in 2014, there are much more adventures yet to come here in Scotland. In the meantime I need to decide soon how I will spent my weeks over Christmas, with having four weeks to spare I am currently planning the next adventure. When asking my friends about a good challenge they mentioned sitting still and relaxing, and I scratched that off the list of ideas straight away. I could possibly do with a bit of quiet time, but with so many paths left untraveled I will happily leave the peace and quiet to later. There are a couple of options I am exploring at the moment, and after cycling to Germany the last two years in a row I might opt for something more adventurous this time. I had a great year on the bike with hardly any injuries, although I had to postpone cycling the length of Scotland until next year. Possibly the most significant achievement was doing the trip from Germany to Edinburgh in three days with cycling 502km without any sleep in between, I am still chuffed about that achievement. There have been many, many other rides as well, like cycling to the London Olympic Games in two days, which was one of the most special experiences this year. Now it’s time to cap a great year off and say hello to another one, on the bike. The most inspiring trip I have came across at the moment is the winter trip from Tom Allen, who cycled around Norway and Sweden in 2011, and just looking at this short clip gives me goosebumps (and not only because it looks cold that video). I can also recall reading Alistair Humphreys’ books, being particularly fascinated by his journey through Siberia in the middle of winter. Adding my winter cycling experiences in the last two years to the mix I am getting more and more excited when I hear the words snow, ice and cold. As there is nothing set in stone at the moment, keep an eye on this space, I have to make my mind up very soon. One thing the thought about a new trip has made clear to me: I LOVE CYCLING. I have tried other things, most recently kayaking on the West Coast of Scotland and recently added a wet suit to my adventure kit collection, but there is still nothing that can beat a great day on the bike. Last weekend was a great proof for that again, but pretty much any journey still has some magic in it for me, even the few kilometers from home to the train and to work. Every day I get the chance to cycle home from Stirling I feel privileged, as every commute counts as a mini adventure. Even cycling mostly the same routes from Stirling to Edinburgh (or vice versa) still holds some surprises. One of those was missing the turnoff two weeks ago and continuing along the hills to end up in Dollar, and I couldn’t stop me from cycling up to Castle Campbell and further through Dollar Glen to end up on the other side. And after all that effort (singlespeed cross bikes are sometimes tricky to ride on rocky and steep single track) I decided to still head back home to Edinburgh, with the whole journey adding up to 90 km after a busy day at work. Although a bit tired I was fully relaxed at that point, and this is why I love commuting on a bike. It’s a healthy drug! But as I mentioned my ride last weekend earlier, I can add that to the series of pleasant bike rides as well, and the list is getting longer and longer. With breaking the 200 km mark for the first time since the Paralympics I was pleasantly surprised that my body has not yet decided to switch to winter mode, and I will do my best to prevent that, even if the days are getting shorter and shorter. 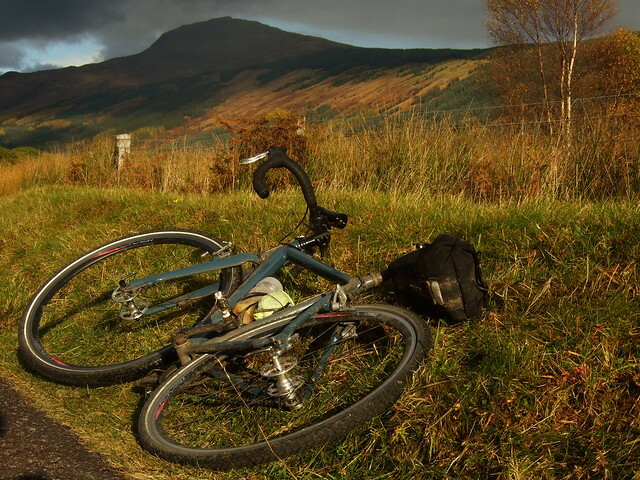 Having rediscovered the magic of the west coast, I managed to pull a great ride on the singlespeed from Glasgow to Gourock, with the ferry to Dunoon, along Loch Eck to Inveraray, from there to Dalmally and up Glen Orchy for the first time. 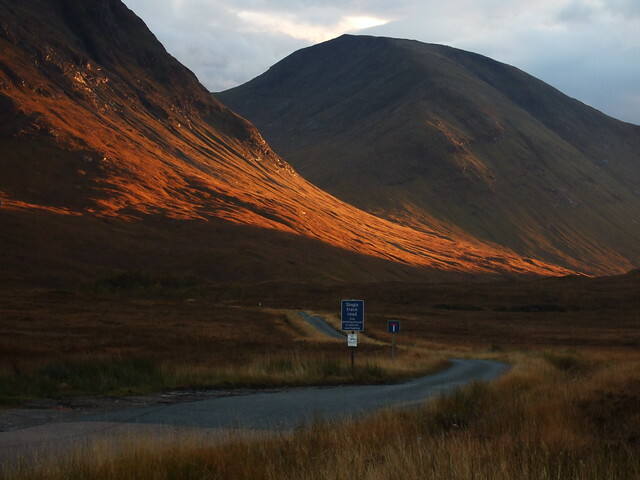 Having skipped Glen Orchy for various reasons on my trips, I was utterly fascinated and couldn’t get enough of the breathtaking scenery. Cycling it on one gear wasn’t a piece of cake, but a good challenge. The joy continued cycling over Rannoch Moor and into Glen Coe in the sunset, with the sun breaking through the clouds producing a magic light. Enjoying some good chat and a good meal at Ben Nevis Inn rounded the day up, and the next day home to Edinburgh was nowhere near being less exciting, catching the early train to Rannoch and following a very quite road along Loch Rannoch to Kinloch Rannoch, then on to Tummel Bridge and Queen’s View, before heading south from Pitlochry over Blairgowrie to Perth and finally home to Edinburgh. Especially the last stretches on Sunday and Monday were demanding, although there was much left in the tank on both days. The conditions weren’t nowhere near perfect, but I am a firm believer of making the most out of whatever situation there is. If the weather is dull, then focus on the riding, if the riding is dull, focus on the scenery, if the scenery gets dull, there are maybe some interesting people around, and if you get bored after many hours in the saddle, always think of the satisfaction there is once you’ve done it. This list is pretty hard to finish. As long as you like to cycle, you will possibly never get to the bottom. what kind of saddlebag is this on the picture? And how much stuff do you get inside?